P.S. City ID #3677 Primary renter must be at least 25 years of age. No Pets Allowed. 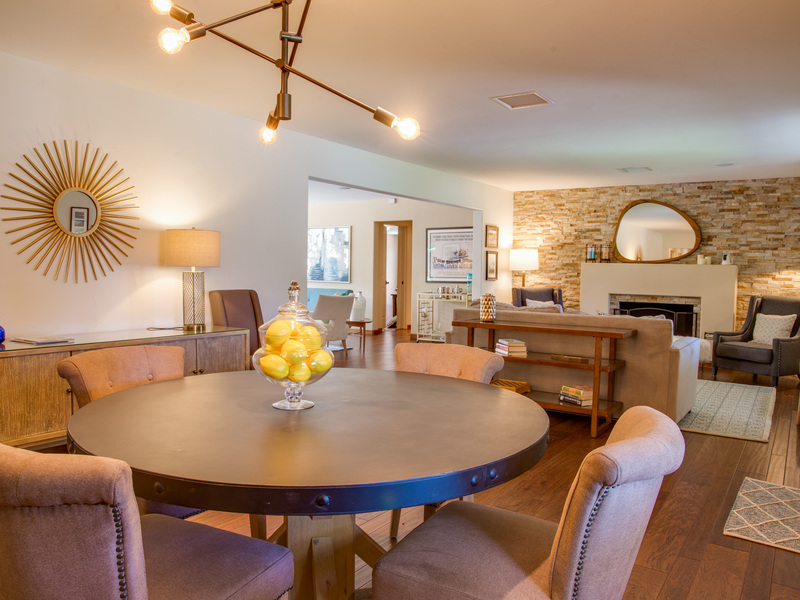 Welcome to the Arbor at Deepwell Estates - a fabulous updated Palm Springs vacation home where it's all about relaxing in the sunshine. This midcentury designer home (circa 1954) takes its inspiration from all of your favorite MeTV television programs from the 1950s and 60s. You'll feel as though you just stepped onto the set of Father Knows Best, Leave It To Beaver, or My Three Sons. If Laura and Rob Petrie had a Palm Springs Vacation Home - this is what it would have looked like. 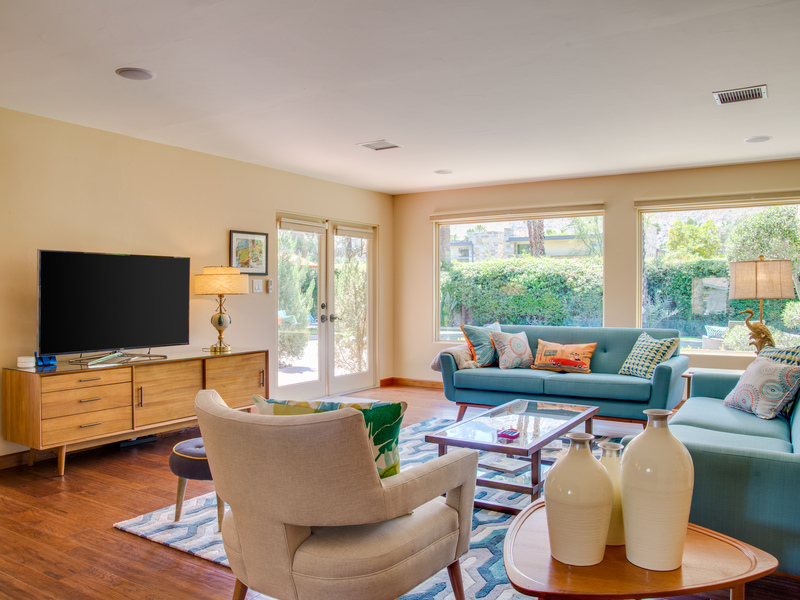 The owners use this home themselves often - so they have updated it with all the essentials like high speed internet access, 4 flat screen televisions, new baths, and brand new midcentury-inspired art and furnishings. If you are a Mid-Mod enthusiast - you are going to love this property. 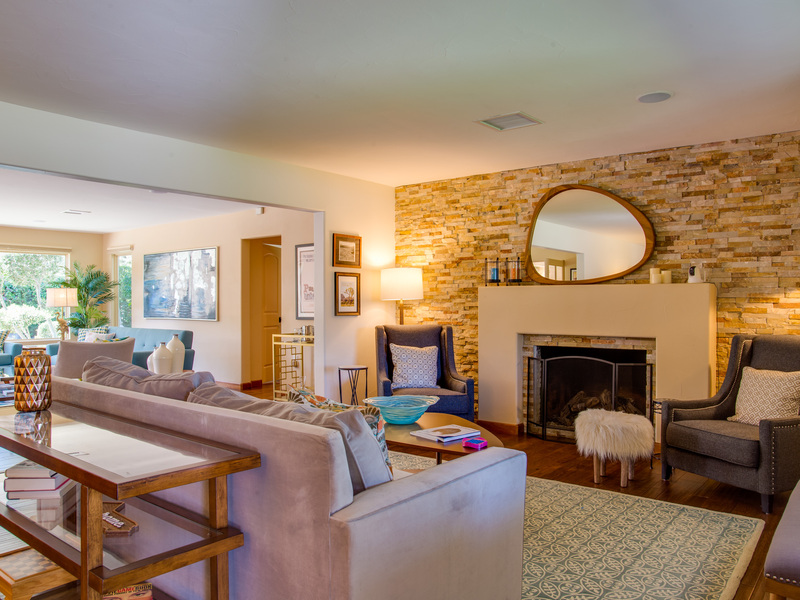 Retro chic style meets comfort and modern convenience in this sprawling ranch home. The free flow floor plan provides the perfect space for gathering as a group. The living room, dining area and family room are all open to each other. Large windows and french doors blur the lines between indoor and outdoor living in true Palm Springs-style. As gorgeous as the interiors of this home are - it is the outdoor spaces that are its crowning glory. The large windows and french doors along the back of the house reveal the awesome resort-style pool yard and spectacular mountain views. Towering Palm Trees dot the back yard - which is completely enclosed by a tall mature privacy hedge. The fruit trees on property provide fresh lemons and grapefruit. The oversized sundrenched pool and spa are surrounded by chaise lounges, occasional seating and shade umbrellas. The huge outdoor living pavilion offers respite from the warm desert sun. You'll spend most of your time in this very handsome outdoor great room where you'll find a comfortable conversation area with its own fireplace and a round dining table for six. 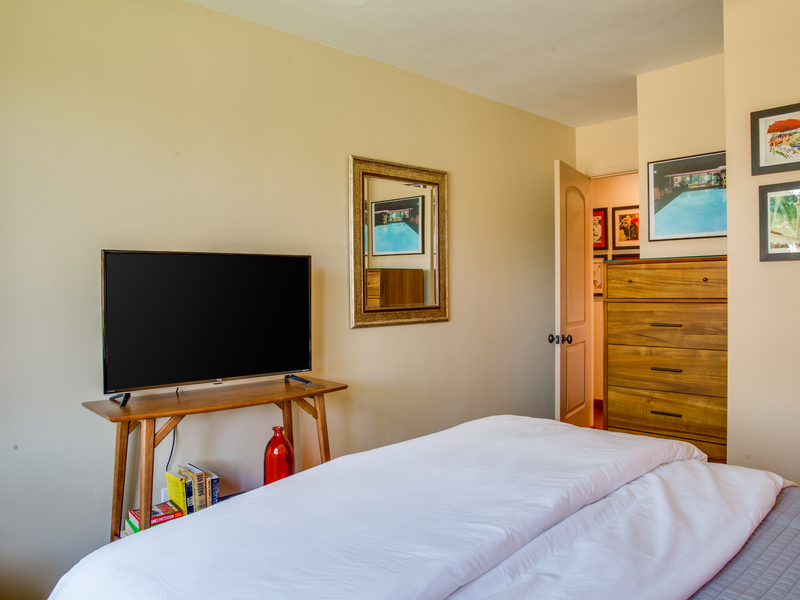 All three bedrooms feature hotel-quality mattresses, ample storage, and flat screen televisions. Each has just been professionally designed like a fresh boutique hotel - capturing the nostalgic vibe of the year the home was built - 1954. Large bay windows, tailored drapes, upholstered headboards, and fluffy white cloud-like bedding. The king master is stunning with its en suite bath and french doors that open onto the outdoor living pavilion. The king and queen guest rooms share easy access to the hall bath. 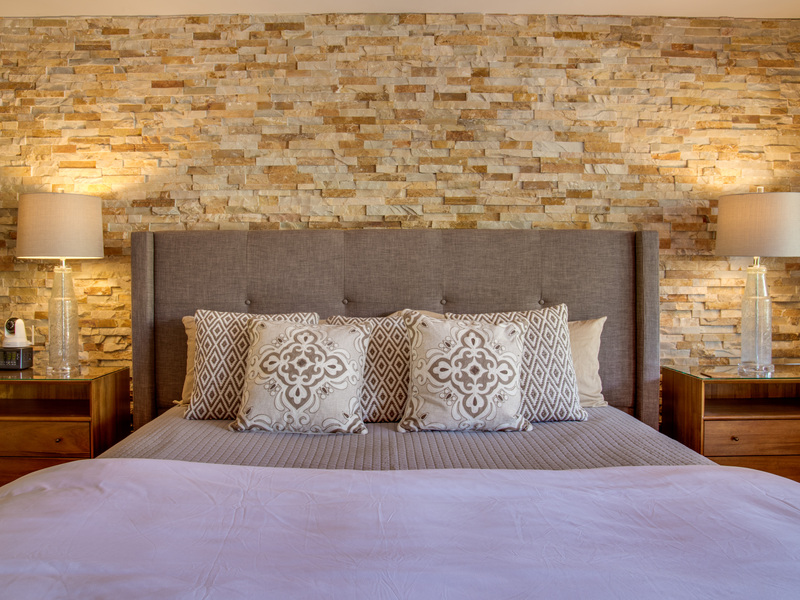 Don't be surprised if you find yourself sleeping late or retreating to your sleeping quarters for an afternoon nap. There is a full size pull out sofa in the living room for the occasional extra guests. The home is nestled on a beautiful parcel in Deepwell Estates, a quiet neighborhood forever associated with the Hollywood legends who have lived here. 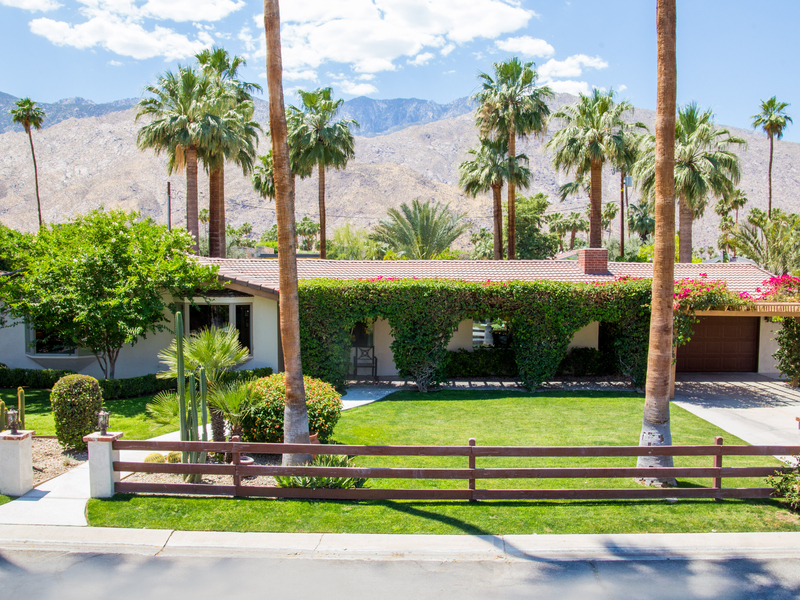 Today, Deepwell Estates continues its legacy as one of our most sought after neighborhoods in Palm Springs. The location is perfect for strolling to some of South Palm Springs' newest hot spots. Cabarets, fine dining, and art galleries are all just a few blocks away. Grocery stores, sandwich shops, burger joints, liquor stores and other neighborhood conveniences are all in walking distance. Optional concierge services including daily and mid-stay maid service, poolside massage, pre-arrival grocery stocking, and private chef can be arranged with three-week prior notice. "The Arbor at Deepwell Estates looks exactly like its photos. Expansive, beautiful outdoor area. Lovely pool, very private. Interior of the house was very clean and nicely decorated. Appreciated the many towels for poolside use. Well stocked kitchen cabinets with all the plates, glassware, utensils and pots and pans you will need. The master bathroom has a rainfall shower, which was fun, never have used one of those before. 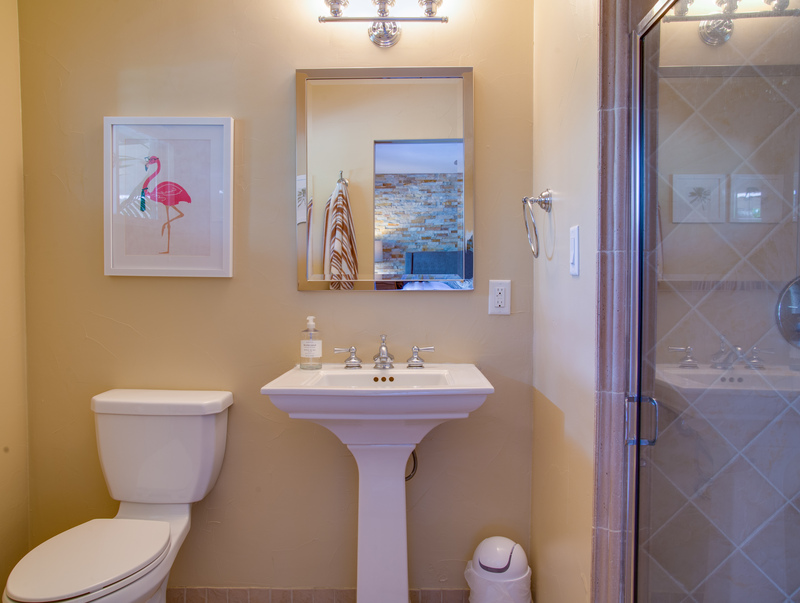 Not much counter space in the master bath however. Closet space excellent, beds comfortable and lots of pillows. A/C in the house worked perfectly and we never had to fool with the thermostat the entire four days we were there (outside temp went up to about 105). Lots of birds to listen to; we also saw a bunny and a couple of roadrunners. Fantastic outdoor space (including an outdoor fireplace) if you have several friends joining you. The only drawbacks for me included the power poles and power line that ran the length of the back of the property. I did not notice this in the online photos; it might be no issue to another person. There is also a busy street on the other side of the wall with trucks going by frequently. Several hours on Saturday were taken up by the city trimming palm trees (along this same road), which made things very noisy. The palms drop a lot of stuff into the pool. Acme was nice enough to send out their pool person the day we got there. We were able to skim the pool ourselves the rest of our visit, but you'll never get up all the "fuzz" from the trees. The pool was huge and warmed by the sun, we did not need it heated. They have some "noodles" for you, and there are a couple of nice floats in the garage (awesome to be able to park the car in the garage). A really lovely house with everything you want for a fun vacation get away. A special thank you for Acme for caring about their renters' needs, they were very responsive to our questions. You'll love this pretty house." Manager Response: Glad you enjoyed your stay Jane. Thanks for the feedback. Yes June and July are Palm Tree Trimming time in Palm Springs in all of the commercial and residential areas. Just part of life here in the desert. Good to know our team was able to take care of you by giving the pool another clean upon your arrival. The Deepwell neighborhood is close to the South Palm Springs Business District - but we have never had guests mention road noise since the main thorough fare - Palm Canyon Drive is about a quarter of a mile away. But again - during Palm Tree trimming season there is often a lot going on. Thanks for the 4-Stars - next time we want to do what we can to bump that up to 5-Stars. "This is a great house. Very quiet location, convenient to stores, etc., beautiful neighborhood, comfortable beds, nice bathrooms, lovely back yard with a big pool. We had a bit of trouble with the front door lock (our mistake) and the Acme folks were there to help us in 10 minutes. The best part - it was spotless! No peeling paint, nasty grout, etc. that so often show up in rentals. We couldn't have been happier." 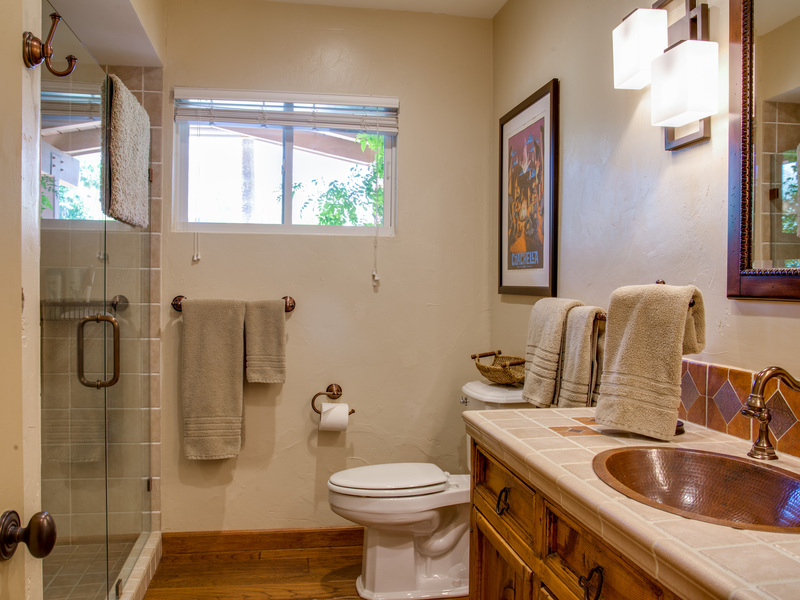 "ACME House Company is an amazing place to look for rental homes in Palm Springs. The customer service is some of the best I've experienced. They really do want to make your getaway as perfect as possible from the pre-check-in, to the check-in process, and throughout the entire experience. The check-in experience with Michelle, was the best. It really made everything seem so personalized. The house looked great in photos but looked even better in person. My family was very impressed with everything. We really enjoyed staying at the house." "Right price, and exactly all the amenities we were looking for! Best part was the pool! Excellent meeting all of our expectations. " "The entire experience was great! The backyard living area was very nice. Very comfortable, clean and a great overall experience! " We just loved this place! "We were skeptical with the lack of reviews and were nervous to know that this property was new to the vacation rental market. But the Acme Travel Planners assured us it was a good choice. They were so right! Spacious and very very comfortable. Upscale but very livable. Wonderful location in the Deepwell neighborhood which is very close to town. Our favorite part was the uber private pool yard with it's fabulous outdoor living spaces. Thank you to Acme and to the homeowners for your hospitality." "Came here for a photo shoot and did not want to leave. This really is my dream home. Cool midcentury vibe, great outdoor space that balances shade and full sun areas, and really comfortable furniture both inside and out. "